Singing, dancing, and celebrating every Friday and Saturday Night. 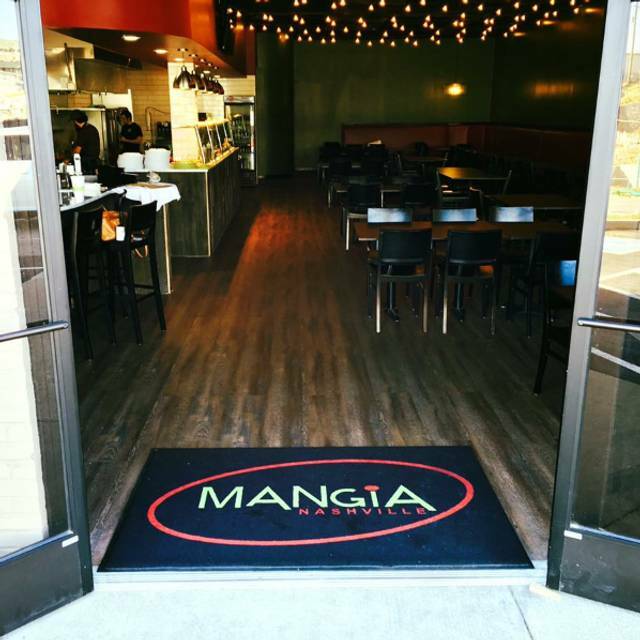 Mangia Nashville is two restaurants in one. 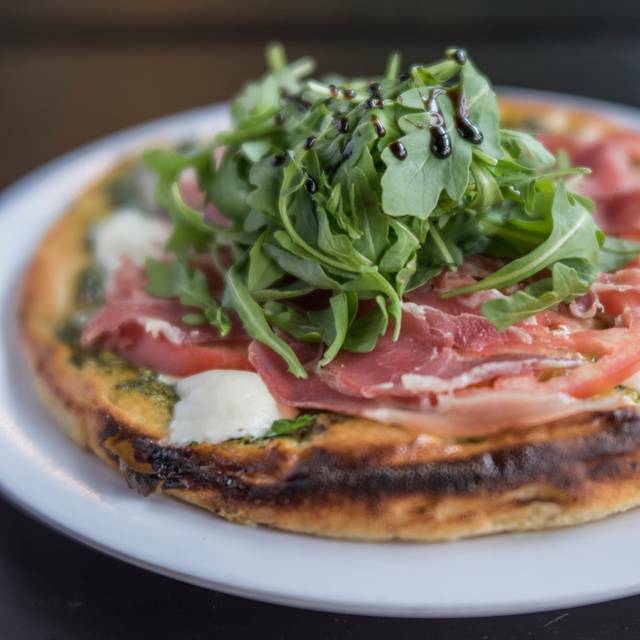 Monday through Thursday from 4pm till 10pm we are a traditional Italian focacceria. We make all our bread, pizza, and cheeses in-house daily. 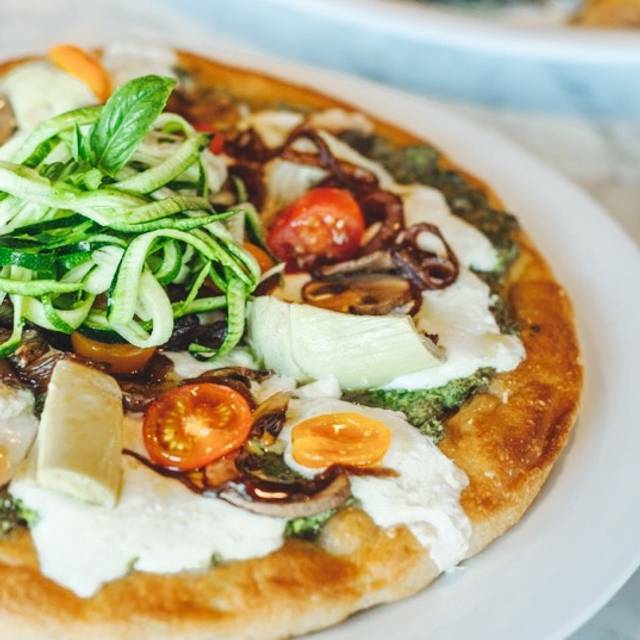 Delicious pastas, pizzas, salads, sandwiches, and desserts combined with a unique cocktail, cordial, and wine list makes for a fantastic dining experience. 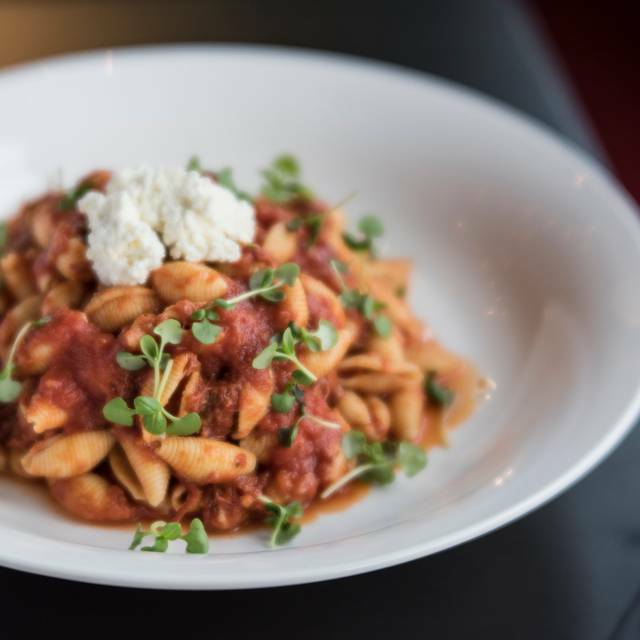 Daily happy hour, pasta, and appetizer specials too! Every Friday and Saturday night starting at 7pm we begin our Italian Feast. This Italian feast is best described as a big Italian wedding when no one gets married and everyone leaves fat and happy! We sing, dance, eat and celebrate for 3.5 hours! $55 per person. All menu items are available Gluten Free. 1/2 Price Wine for Girls Night Out!! Enjoy 1/2 Price bottles of select wine ALL NIGHT every Thursday!! $4 House Wine!! 1/2 off Pasta!!! 4pm till 7pm every Wednesday!!! $2 off all Food Items, Speciality Cocktails and Amaros 4pm till 7pm every Tuesday!! 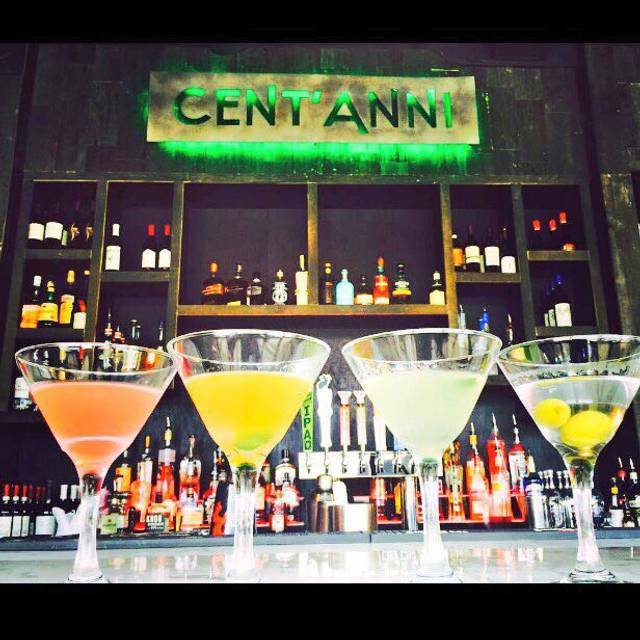 Enjoy 1/2 price Martinis and 1/2 Price Appetizers from 4pm till 7pm every Monday!!! Amazing gluten free menu, delicious food, and the best service we had in Nashville. FANTASTIC! Great food, great atmosphere, reasonable prices, and SO MUCH FUN! We went here for a Thursday night dinner, not their feast on Friday and Saturday, because we love Italian food and it was within walking distance. The service while not any special was okay though the waiter looked at us several times like we had three heads each. The food was not great. I left thinking that I would have preferred Olive Garden and definitely shouldn’t feel that way during what should have been a nice meal out. The chicken parmigiana was burnt on the bottom, and when I asked for sweet sausage I got sausage so spicy that I felt like I would be sick. The sauce was nothing special and the canned sauces taste just as good. The one television was playing the weirdest show imaginable and it killed the fact that this could have been a very sweet quaint restaurant. I will not go back even though it wasn’t the worst thing, since it was extremely over priced for the portions and taste received. We had a great time at Mangia. The food and service was excellent and the singing and dancing was just incredible. Will definitely be back again. Third time here and never disappoints! Such a fun, unique experience! 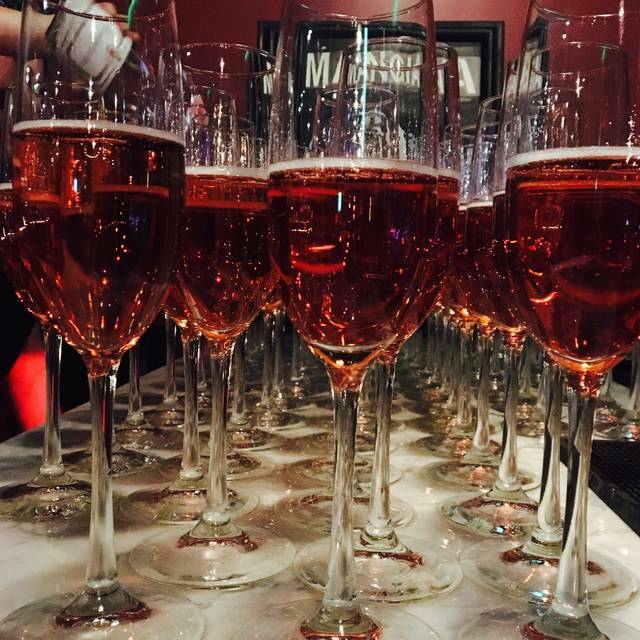 We love going to Mangia to celebrate any occasion! It is a great concept but it was so noisy in there you could not talk to the person next to you and you could not hear the waitress talking and she could not hear you talking. The service was horrible. Had to ask for water several times before receiving it. Did not stay on top of taking orders for more drinks. Would have to go and find the waitress to order drinks. Some of the food was cold when you got it. I think it is great dancing between the courses that was the best part of the night. Wonderful food and atmosphere. Will go again. Only downside is that is was very loud in the dining room. Conversation was difficult and we could not hear the waitress half the time. Very fun night. Food was delicious but the night went a little longer than I would have like. It was almost a 4 hour night by the time we left. But it was a very fun experience. Not the best experience. First, I was seated with my two young children and after getting all settled was told that I was supposed to have been seated closer to the front of the restaurant (presumably due to having two small children). The service was adequate, but not great, as the server did bring us the wrong check three times. The food was sub-par... good focaccia if you're going just for the bread itself, but pizza on focaccia bread just isn't a great idea. Kids' chicken strips were dry and inedible. If you want a quiet dinner, Mangia is not the place. If you're looking for a 3-hour party with lots of great food, friendly servers, dancing, singing, and swaying, go to Mangia. A must-experience night when in Nashville! There's a reason you must make a reservation months in advance! The food is phenomenal and the "entertainment" so much fun. Chef Nick is amazing how he juggles creating one incredible dish after another all while interacting with the crowd. GREAT food and service! One in our party has celiac informed us that everything except the lasagna could be done gluten free, EVEN the bread! One of my favorite restaurants! The food and atmosphere are always delicious and top notch. Open kitchen allows for Nick's personality to come through not only in his cuisine, but through his energy and passion for sharing good times and good food with family and friends. Already booked our next trip and can't wait! Food was fantastic! Can’t wait to go back, and enjoy another fine meal. The olives were great! Mac and Cheese was super yummy. I love this place! We have enjoyed the Feast dinners but this is the first time for weekday dining. The rice balls were delicious but being an olive fan the fried stuffed olives were a light tasty starter. The baked ziti with added meatball for me and spicy sausage for my date was tasty but a bit ordinary. The take-out eggplant Parma was great! Friendly fun service, good choice of wine by the glass. Sorry no room for dessert! Next time we will try a focaccia pizza and fresh cooked pasta, instead of a baked dish. Good value! A fun evening out. Lots of energy from the servers and the crowd. Family-style eating and the food was really good. And LOTS of it! The only one not "into" it was the young man who delivered food and cleared the table. He would mumble when he announced what he was bringing us and if we asked a question he had no idea or interest in where he was or what he was doing. But the other servers and people who worked there had contagious energy and joy. We can't wait to go back! The best dining experience in Nashville! Chef Nick and his staff make it an event, even for those returning time after time. 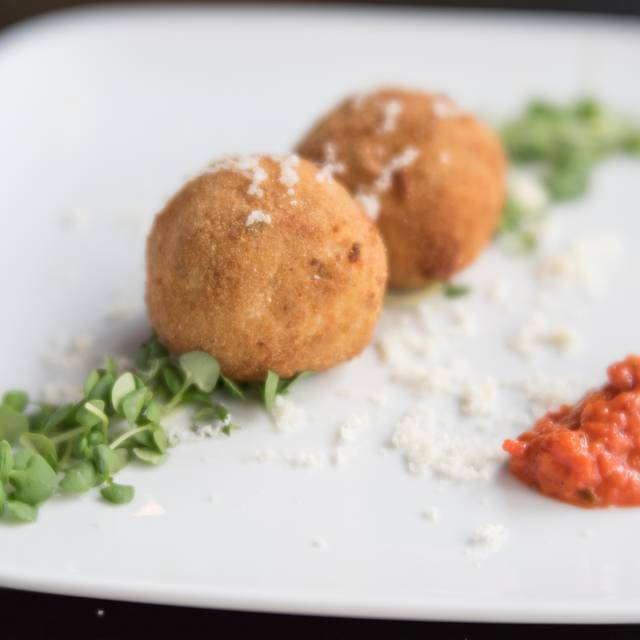 More amazing Italian food than you can imagine (for a great value) and an evening you won’t forget. 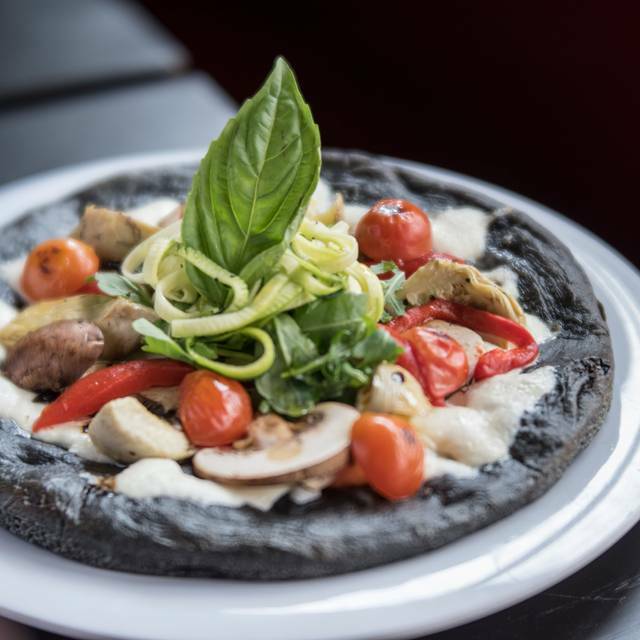 My Great experience with Mangia’s started with the reservation. I had to make several changes and they were accommodating and a pleasure. Once my family arrived we were treated like royalty. The staff was wonderful from the minute we all walked in. They were fun, friendly, energetic and we had a great time. The food was delicious and plentiful. They do not miss a beat. Even when they have you all dancing and singing!! My friend and I had a wonderful time at Family Dinner. The food, service and family environment that was created was wonderful! I would like to encourage anyone who attends to sit back, relax, get to know your neighbors and don't be a bore during the dinner conversations. Honestly, had we ended up at the other end of the table with some not so fun guests, it wouldn't have been as exciting. This is a family diner after all, sharing is caring and the more the merrier! Went on Valentines Day. Meal from 7-1030. Good food. Great time. What a great way to spend a valentine's night! My inlaws loved it too! Great food, laid back atmosphere. Recommend to anyone looking for good Italian food. Should have better ventilation in the kitchen. Food was great. Service was great. This is our second visit and I must say I enjoyed our first visit wat more. This visit was over populated just too many people so it was hard to just enjoy the experience. That being said it was still an awesome experience, just maybe not reserve to such a limit as when we were there. This is much more casual than advertised. The ambiance of this restaurant wasn't great. The food was ok Italian food. Very forgettable. The service was really awful. Our waitress clearly hated her job and acted like we were an inconvenience to us. The service, decor, and ambiance of this hidden gem were outstanding! Our waitress, Kiri, was extremely helpful in making suggestions for us as "first timers". We had the short rib meatballs as an appetizer and they were delicious. I opted for sun-dried tomato pasta with spinach cream sauce and it was out of this world. Hubby chose the steak sandwich and it was dynamite. Zeppoles for dessert. Yummo! We will be back...again, and again, and again! This was our first visit to Mangia and Rachel welcomed us and took great care of us! 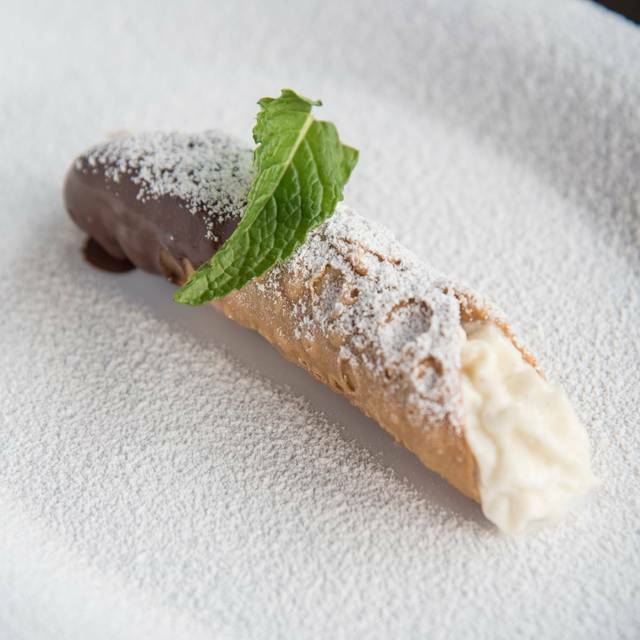 We loved everything we ordered from starters to the cannoli finish! We will be back for sure! Excellent food and really nice service. Ambiance is so-so for this old person with money, but probably okay for people that never wear anything but jeans. Attractive bar area and good prices. I apologize for not liking the environment more. It's not bad, just not very warm....On the other hand, no one has to dress up, and that seems to be more important to most people..just not to me. It shouldn't stop ANYONE from going here for the great food. It was our 39th Anniversary of our first date (it was a blind date). We always go out to an Italian restaurant as we went out for Italian food on our first date. At first were a little off-put as we were seated with six people rather than a table for two but they were very nice & we had a great evening. The food was delicious and enjoyed the music & dancing (didn't participate much, as Dan has a bad knee and I had surgery a couple of months ago). Have told everyone how great the food was & it was so much fun. Terrific Birthday for my father! Thanks Mangia for making it so special! this was our second party at Mangia and it again was one of the best dining and fun night experiences we have had. the Saturday Italian wedding night theme is a ball and the food is outstanding. Go hungry! We went for a 3 hour feast with a large group of friends on a Friday night. I really enjoyed myself.....the food was good and the atmosphere is great! It’s a bit pricey especially if you add drinks and I would have preferred a little more presence by the waitress in terms of refilling drinks, but I would recommend this place to anyone who loves Italian food and would enjoy a little entertainment on the side. It was our first dining experience. I took my boyfriend as a surprise for his birthday. We both loved it! The food and service were excellent. The concept and entertainment was awesome! Will definitely recommend. This place is absolutely phenomenal ! The staff was very attentive. The music dancing and food was excellent! I you have never been you simply don’t know what you are missing!